If I have learned anything thanks to Astrocity, it’s that I love me some Kurt Busiek! So despite the fact that I have never been huge into Marvel 616 Avengers, I still prefer the X-Men, when I saw Busiek wrote an Avengers event it was a must read for me. Busiek is enough for me to even forget that Rick Jones is the main character in Avengers Forever. In the future the planet Beta Centuri IV is invaded by an army that looks similar to today’s Avengers. The Galactic Avenger Battalion lead by Jonz Rickard has brought Earth’s rule throughout the galaxy. But what does it have to do with today? Rick Jones is in trouble and seven Avengers from throughout time are called together to aid him. These heroes including a disillusioned Captain America, two Hank Pyms, a young Hawkeye, the Wasp of today (1998), and two Avengers from the future. They are caught in a tug of war between Kang the Conqueror and Immortus that sends our heroes throughout time, alternate Avengers timelines, and Marvel history. If the Avengers win, the galaxy could still lose if humans are allowed to use the Destiny Force under Jones’ power. The story ends with a massive battle between Avengers good and bad from divergent timelines with all of existence as the prize at the end of time! When will the MCU go into time travel? It has to happen right? It really should happen! Because this story has divergent timelines we get to see several what ifs and fit them into the Avengers’ universe. These variants include the Agents of Atlas and the future Guardians of the Galaxy, complete with Yondu. We even get to see Avengers interacting with Marvel Western characters! And it really does work. In many ways this story retcons the Marvel universe by making it clear that divergent timelines and branches exist. Therefore, even if a story did not really occur in the Marvel 616 it can occur in other universes, like the Marvel Cinematic Universe. It really is fun to see all the variants and I do believe that someday we will see time travel and alternate universes in the MCU. And they travel in a time machine that looks like a Sphinx, seriously fun! Kang and Immortus are complicated. Hey kids, they are the same person. But Kang does not want to become Immortus. It’s complicated! Kang is a warrior. He conquers, hence his name! Immortus is a scholar. He does not fight. And worst of all to Kang he has become the tool of the real villain in the story, the Time-Keepers. So the real struggle is between these two, a man who hates himself! And at times it is questionable to the reader if the Avengers are fighting on the right side! The most interesting character to me in the story is the disillusioned Captain America. This Captain America from the 1970s has witnessed America at its worst. So he is not the earnest positive guy we are used to. No he is the earnest grumpy Cap we have never seen. S.H.I.E.L.D. does help Captain America on his journey to the most idealistic Captain America of today. Rodgers has a conversation about the meaning of all his adventures and if they matter with Nick Fury, or an alternate Nick Fury, or a time illusion of Nick Fury. Together the two arrive at a very Captain America answer which helps us feel good about our hero. Speaking of Captain America, he brings us to the crux of the argument. The Time-Keepers want to contain humans, the galaxy’s ultimate evil. But Cap asks is evil really humanity’s nature. He argues that man’s nature is to learn and to change for the better. The Avengers do not need to become a conquering army, someday. So Captain America fights for humanity’s future and the right to choose. And in this big story, which can at times get a little too talky talky to the point where you forget where you are going, Cap’s spirit makes you feel like this is a battle worth fighting. Time traveling Avengers sure does sound good to me. I still prefer Busiek’s Astrocity. 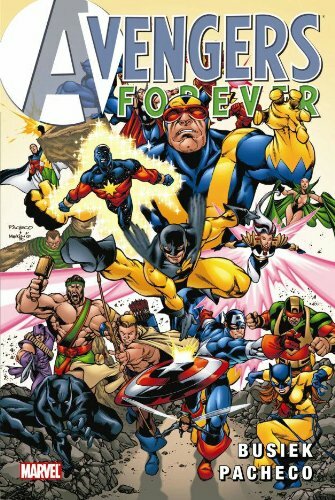 But Avengers Forever is a good key Avengers story that Avengers’ comics fans will want to read, if they have not already. And as a MCU fan looking in the comics for the next good idea, time travel does not sound bad to me!